We fans of floral leather fragrances may be in the minority, but we’re passionate. There’s something about floral delicacy playing against rough, salty leather, and even better when the leather is softened by moss. If you love floral leathers, the Prism Parfums reissue of Geminesse won’t cause you to abandon your bottle of Chanel Cuir de Russie, but it’s worth a sniff — especially at its price. Max Factor first released Geminesse in 1974. The original Geminesse’s notes included thujone (a plant material that smells like menthol), citrus oils, bergamot, gardenia, coriander, jasmine, rose, orris, narcissus, patchouli, vetiver, oakmoss, amber, castoreum and vanilla. I smelled vintage Geminesse once, when a vintage clothing shop owner showed me a demure-looking bottle wrapped in a pale green ribbon with a Barbie-sized bouquet of flowers wired to it. I sprayed it on and prepared myself for a tame floral and instead got a wicked leather with a real animalic growl. I thought, This is what Tigress should smell like. Of course, smelling vintage Geminesse is not the same as smelling Geminesse in 1974. (Are animalic notes like chili, where the heat builds over time?) 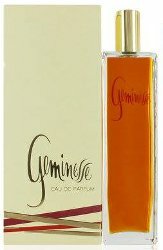 The Prism Parfums release of Geminesse doesn’t smell like the vintage Geminesse I sampled. It’s less skanky and spicy, for one thing. But it’s still a floral leather. If I had to sum up the new Geminesse Eau de Parfum in a few words, they would be “orange blossom leather.” Geminesse kicks off with an aldehydic top register and a burst of dry citrus neither as sharp and green as Piguet Bandit nor as wet as Christian Dior Diorling. Geminesse’s leather is right up front. It’s thick saddle leather, not the creamy suede of, for instance, Lancôme Cuir de Lancôme. It’s neither as tender as DelRae Mythique, nor as tarry as a classic Russian leather. Its leather lasts all the way through the fragrance’s wear. Geminesse’s floral heart flattens to soapy orange blossom for me, and this is where it parts ways with some of my favorite floral leathers. Wet, earthy violet tempers Pierre Balmain Jolie Madame’s leather. Fuller white flowers with a touch of rose gives Diorling body. Woody spice adds dimension to Lanvin Scandal. I like the soft dampness of a fuller floral heart, or the clear statement of a tart green leather. Geminesse tosses aside romance and attitude and lands on plain old soapy leather. Maybe that’s good. A light-wearing, clean leather might be just the ticket for days when you want no-nonsense leather but don’t feel like getting pushy about it. In any case, even if you simply use Geminesse to make your Ford Fiesta smell a bit more like a Rolls Royce, it won’t break the bank. Besides the floral leathers I list here, I like Ann Gérard Cuir de Nacre, Balmain Miss Balmain, and Heeley Cuir de Pleine Fleur (and probably loads more I'm forgetting). Which floral leathers would you recommend to someone new to the genre? Prism Parfums Geminesse’s list price is $54 for 100 ml of Eau de Parfum and $44 for 100 ml of Eau de Toilette. Online, you can find it discounted to $32.99 and $22.99 respectively. Hi Angela and Happy 2016. I finished my bottle of Kelly Caleche last spring (September). I was surprised by how often I reached for it as I always thought I preferred bolder ‘saddle’ type leathers to its soft notes . But I miss it and think it might be a great gateway leather floral. Daim Blonde is one that doesn’t quite give me the suede/ leather kick I need. I haven’t tried the perfumes you mentioned but have made notes. My mum used to use Propert’s saddle soap on our old leather furniture and that was a beautiful scent…great tin, too. I think it’s my memory of that that drew me to leather. Great post, thank you! I always liked Kelly Caleche but it seemed to lack something. However, every time I ever have worn it, I have been complemented on it. Therefore, I think it is a soft leather that appeals to the masses–unlike some other leather fragrances that we seasoned perfumistas may prefer. It’s nice to have a few lovely and unchallenging perfumes in the arsenal for just this reason! Angela! You read my mind! I just last night had a dream wishing for more floral leathers! (My subconscious has good priorities ) I’m so delighted for the review of this one, as well as the points of comparison–so many to try. Merci! I hope you find one you love!! I was starting to get excited about this one (I love Cuir de Lancome and Jolie Madame, and I wear Kelly Caleche edp fairly often as well) until you said “orange blossom” and “soapy.” OB frequently does that soapy thing on me, and I’m certain I wouldn’t enjoy soapy saddles on my wrist. P.S. Cuir Cannage, that’s a nice floral leather. Oh yes, a good one! Yes, to me it was a bit soapy, so it may not be the perfect floral leather for you–a bummer, because it’s such a relative bargain. I’m for Kelly Caleche too. I was wearing it (the EDT) at work once and someone told me I smelled like violets. There is apparently no note of violet in the EDT, but after that remark I smell violets too. Perhaps it’s just a smell illusion created by the cool, slightly damp florals. No matter, Kelly Caleche is now my own private violet leather fragrance. Okay, Jolie Madame it ain’t. This whole thread is leaving me with a longing to wear Jolie Madame. (Except that I’m planning to head off to the den to watch “The Sting” with my teenage/college age offspring, in front of a roaring fire, and two of the three of them despise Jolie Madame. So it will have to wait. Ha! The things we do for our kids. I can’t scent my linen cupboard with sandalwood soap (the really strong stuff you get from Indian grocers) because my son complains so much. Do you have heaps of Jolie Madame, Mals? It seems to have been d/c, and is getting hard to find. Sandalwood soap sounds terrific! Alas, I can’t think of a single Indian grocer here. I’ll hunt it down! Thank you. I just impressed that your kids know enough about perfume to have an opinion on Jolie Madame! Mine don’t like it either, and although I keep telling myself JM is too cold, cruel and heartless I keep reaching for it anyway when they’re not home. I wonder if that hint of leather brings out something like violets? Yes, maybe they are good companions. Funny – one so delicate, the other so strong. Yet they’re so good together in Jolie Madame. I love this combination in Atelier Cologne Sous le Toit de Paris and after wearing it, violet and leather are inextricably linked in my olfactory center. I find a similar accord in Annick Goutal Duel and Au Pays Violette Sacrée. Hermès Cuir d’Ange adds heliotrope to the mix, with a blend that is a distant cousin to that found in Esprit d’Oscar and the original Oscar de la Renta parfum. I get a leather note from both de la Rentas, particularly Esprit d’Oscar, though it’s not listed in the notes for either. Violet and heliotrope are, however, so I’m not sure if I’m smelling leather or if it’s facets of the violet translating as such. You’ve got me curious about Geminesse and Tigress; Lanvin Scandal will also go on my leathers-to-try list. I never thought about the relationship between Esprit d’Oscar and Cuir d’Ange–it never entered my mind. As soon as I finish this comment, I’m going to find my bottle of Esprit d’Oscar and give it a spritz. It’s been too long! Hi Angela! Happy New year to you. Hope you had a great holiday and 2016 will be a good year! Thank you so much, and Happy New Year to you, too! Happy New Year, Angela. I’m curious about these rereleases from Prism Parfums and appreciate your taking the time to review them, even if I haven’t smelled the originals. It’s nice to escape from department store sometimes and these sound just the thing. So far from what I’ve tried, the original Bottega Veneta is still my favorite floral leather of all time. Hermes Cuir d’Ange is very pretty, too, and I’m still wearing it carefully since getting over a cold so I can truly appreciate it. I did really like Cuir de Lancôme for a time, but overapplied and overwore it so have to build up an “absence makes the heart grow fonder” appreciation again. How could I forget about Cuir d’Ange? Or Bottega Veneta (although that one to me is nearly an oriental)? I just sprayed on some Cuir de Russie. Fabulous. Ah yes Angela, I spray Cuir de Russie quite often…it is absolutely fabulous! It helps me to get through some work tonight when I’d rather be reading…. Bit late to the party but just wanted to add MPG Cuir Fetiche to the floral leathers. I find it to be similar, notewise, to Cuir de Lancome but a little denser. Still very feminine though. I’ve considered buying a bottle of Cuir Fetiche a few times, but the cost put me off. But it’s a good one! Leather has always held a place in my heart in fragrances and I have Mentally “Nosed” a few, One was called Fleur de Cuir. It would be comprised of a Very Thick Leather base, Very shall one say, Raunchy, and Animalic… not polite at all… Layered upon this, A Sparkling opening of Tangerine, Mimosa, White Freesia and Tuberose. Yes Tuberose… Can you imagine Really Indolic Tuberose and Leather? Middle notes of Tiare, Allspice, Juniper, Cypress, Opopanox, Lavender, Damascus Rose Absolute, Hyacinth and Galbanum. Just a dream…. I suppose!